Without exception, every casino win/loss statement has some type of disclaimer language. The casinos essentially discourage the gambler, the IRS, and anyone else for that matter from using these amounts for any accounting or tax purposes. What the casinos are saying, without really admitting, is that the information summarized in a casino win/loss statement is for marketing purposes. It is a tool that they use to rank their customers. This tool has limitations that they are unable to overcome in order to make it a reliable source of accounting and tax data. As you may be aware, the records we used to arrive at these amounts provide estimates only and do not constitute an accurate accounting record. This [Players Club win/loss] statement does not reflect an accurate accounting record – it merely provides an estimate that you can use to compare to your own records. Due to the large amount of information from our members, most reports would simply be too long to include this type of detail [information about daily sessions]. 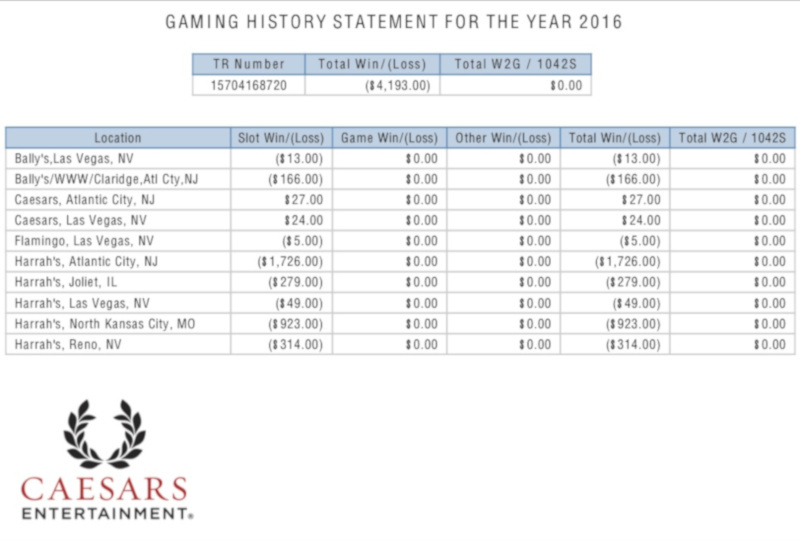 This information does not constitute a definitive accounting of your gaming activity; rather, our records provide estimates only. These records have been reviewed and researched to the best of our capabilities. We are pleased to provide you this information as a customer service. However, please understand that [the Casino] cannot accept responsibility for the degree of accuracy of your total gaming activity due to factors beyond our control and outside the limitations of our systems. Please be aware that the individual is responsible for maintaining accurate records of their play. [T]his letter will constitute the requested report covering your gaming activity at the [Casino] that year. In this regard, please note that these records are based on “rating information” not accounting records. The [Player’s Card] rating system is not intended for tax reporting, therefore, we make no representation as to either the accuracy of this information or its effectiveness as a proof of losses. This amount may not include all hand-paid jackpots reportable to the IRS on form W2G. The IRS recommends keeping a diary of your gaming activity [emphasis added] with such pertinent information as dates, slot machine or table numbers, jackpots, and total wins and losses. For specific information on tax return preparation and IRS requirements, please consult a tax advisor or the IRS at www.irs.gov. With such language, it should come as no surprise that gamblers, the IRS, and tax professionals alike hate the disclaimer language used in the casino win/loss statements.